I recently returned from a trip to the ocean. I grew up far from the ocean, and so perhaps that’s why it holds a certain, almost mystical, place in my psyche. It has been at least 5 years since the last time I’d been, and so about a month ago I commented, on a whim, that it was time to go again and I’m surrounded by amazing people who made it happen. The distance from home to the ocean is measured in days. Days, you might keenly notice, is not a traditional measure of distance, but rather is a practical measure of how long it takes to cover the distance. In this case, the ocean was 2 days away, or 16 hours driving, or about 1,500 km. By way of comparison, in Europe you could easily visit 3 or 4 countries on a trip that long! But the drive was beautiful. The landscape I travelled through was wild and empty. There was one stretch of 200 km without so much as a gas station. The biggest town along the whole drive was about halfway along, with a population of 70,000. There were perhaps another half dozen towns with populations between 10 and 15 thousand, but mostly I was left to admire the trees. 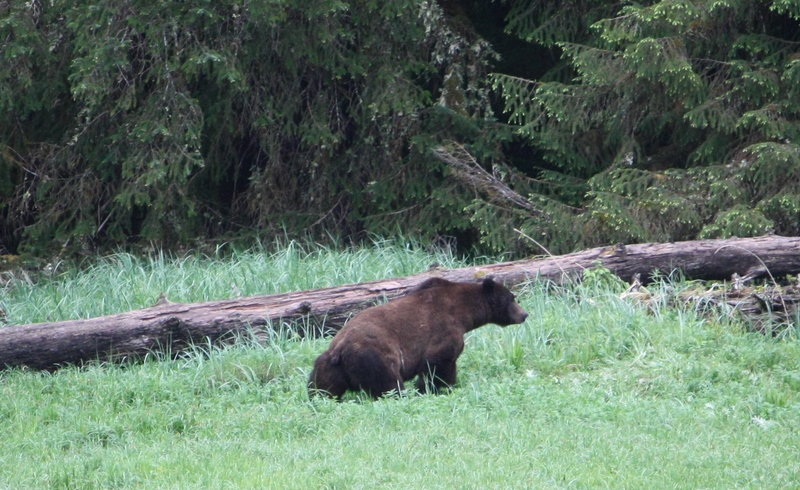 I also found two black bears ambling along the side of the road. Once I got to the coast, I actually didn’t spend much time looking out over the ocean. Part of this was due to the fact that the town I ended up in was in a sort of fjord, so it wasn’t exposed to the full weight of the expansive sea. 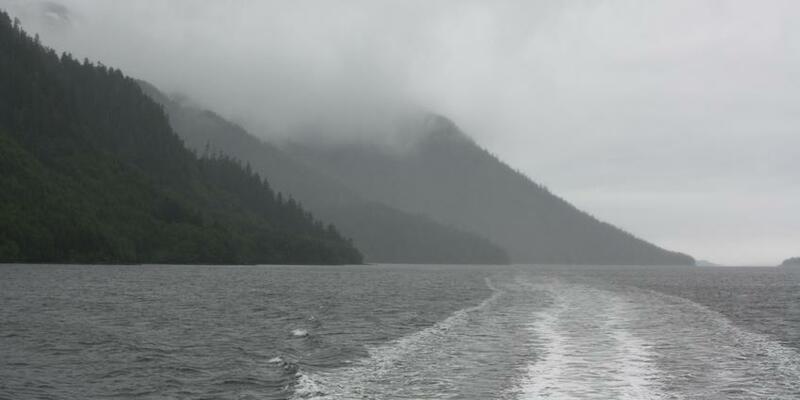 But the influence of the ocean was everywhere: it rained more days than not while I was there, the joggers weren’t deterred by the rain, the trees and plants seemed greener, and I ate some of the best Fish & Chips I’ve eaten (and I like Fish and Chips). One of my days there, I joined a tour up the coast. The boat was a catamaran and thus fast (25-ish knots) and so we were able to travel relatively far. I’d hoped to see whales, but it turned out to be the wrong season. 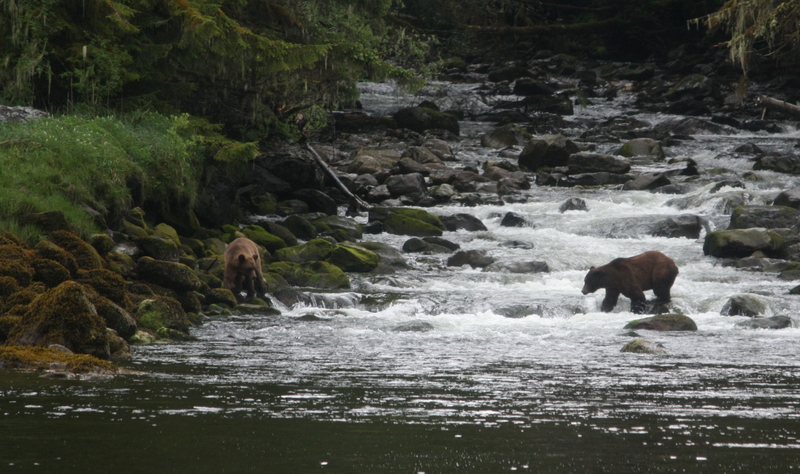 But we were lucky enough to see some Grizzly bears in the wild! Over all, it was a great break from work and my normal routine. And I hope to return much sooner than in 5 years from now.